Local governments would be better able to resolve challenges to unfair electoral processes without incurring costly litigation, thanks to a bill passed late Thursday by the Senate Government Operations Committee. 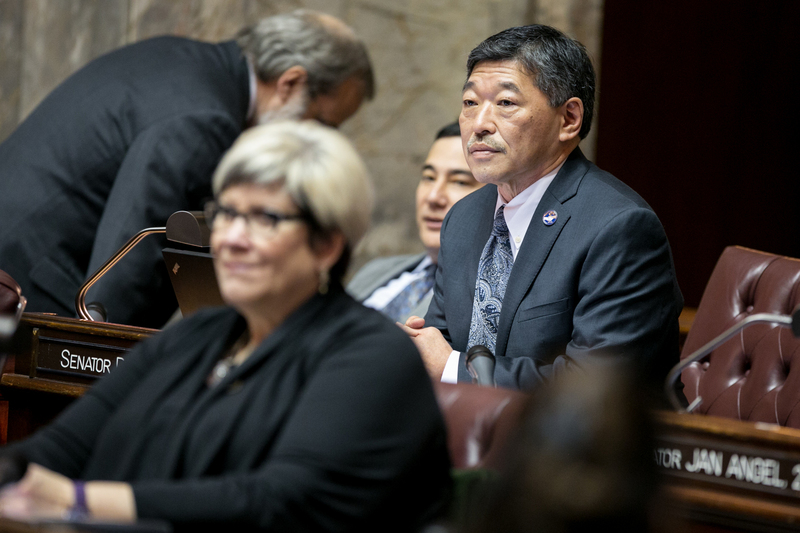 Having already passed the House, House Bill 1413 was amended in committee by Sen. Bob Hasegawa, D-Beacon Hill, to address differences between local governments and bill proponents such as the American Civil Liberties Union and OneAmerica. In fact, the bill was poised to die in committee before Hasegawa asked for a compromise that would address differences he felt had become small enough that they could be resolved. Hasegawa said support from both caucuses, both Democrats and Republicans, who control the committee — Republican Sens. Pam Roach, Don Benton, Ann Rivers and Brian Dansel comprise the majority — set the stage for approval by the full Senate and said he looked forward to the floor vote. The Legislature could finance a state bank that could handle cannabis transactions safely for less money than it will cost to provide armed security for cannabis transactions at Department of Revenue offices and Liquor Control Board offices, Sen. Bob Hasegawa said today. Hasegawa tried to amend the Senate’s proposed operating budget late Wednesday to shift funds allocated for security at those offices to the creation of a state bank, but his amendment failed. The Beacon Hill Democrat has proposed the creation of a bank to handle cannabis transactions but his Senate Bill 5955 died in committee. The operating budget allocates $588,000 for security in 2014 and $856,000 in 2015. Hasegawa’s bill sought just under $500,000 annually to finance the state bank. Growers, producers and retailers who conduct transactions in rural, low-traffic areas face higher risks and have greater safety needs than state offices, Hasegawa said. His bank proposal would provide a secure, safe marketplace for everyone involved in cannabis sales — from growers to sellers to purchasers and everyone in between — and do so for a smaller cost than the funds allocated to secure the state offices. A state banking system for cannabis could also track cannabis transactions to the penny, enabling the state to account for all tax revenues that should be reported as well as detect any cannabis-related activities by organized crime, Hasegawa said. Come to our town hall meeting this Saturday, Feb. 22, from 1 to 2 p.m. at the King County Regional Communications and Emergency Coordination Center at 3511 NE 2nd St. in Renton. OLYMPIA — Public employees and students in public schools would be allowed to take up to two days off each year for reasons of faith or conscience under legislation that passed the Senate on a 47-0 vote this week. Senate Bill 5173, sponsored by Sen. Bob Hasegawa, D-Beacon Hill, would grant public employees the option of taking a new unpaid holiday along with a paid floating day they are entitled to on days that suit their religious beliefs. Similarly, public school students could be excused from school for up to two days for similar reasons, provided they have their parents’ approval. The school absences would not affect school district compliance with educational requirements or enrollment calculations. Hasegawa’s legislation is designed to provide flexibility to peoples and faiths that don’t fit conveniently into the standard calendar. For instance, the two most important Muslim and Jewish holidays fall not on a consistent day each year but on a different day due to the shorter lunar calendar year and the method for determining the date. The 2014 Legislative Session began slowly, but we had a major breakthrough last week which I will detail below, along with updates on a range of significant legislation. I’d like to invite you to attend a town hall meeting I am hosting with my 11th District seatmates, Rep. Zach Hudgins and Rep. Steve Bergquist, where we will provide legislative updates and field questions and concerns from constituents. The meeting is scheduled for 1 to 2 p.m. Saturday, Feb. 22, at the King County Regional Communications and Emergency Coordination Center at 3511 NE 2nd St. in Renton. Meetings like this promote lively, back-and-forth conversations that shape our lives, so I hope I will see you there. The Washington State Dream Act was one of two major bills last year that had not only bipartisan support but popular support across the public (the other was the Reproductive Parity Act) but which were blocked from consideration by the Republican-led majority in the Senate. Both bills had passed the House, but Republicans in the Senate voted against allowing a vote on either of them. It even reached the point where members of the Republican majority claimed they were in favor of the bills yet voted with their caucus to block the bills from a vote. That changed on Friday, when a handful of members of that caucus finally broke ranks and voted with all but one member of our caucus to pass the Dream Act. That version of the bill now goes to the House for consideration, where it is expected to pass. I credit passage of this important legislation to the energetic members of OneAmerica, a committed group of young men and women who worked hard to lobby lawmakers on the merits of the bill. And the merits are considerable: the Dream Act will allow children who were brought here by undocumented parents and call Washington home to apply on an equal basis for financial aid at Washington colleges and universities. These students have grown up here, paid taxes here and gone to school here, and now they want to access higher education so they can develop their skills and contribute to our economy. This is good for them, good for our businesses, good for our communities and good for our state. I am optimistic that the success of the Dream Act may embolden the same members of the Republican majority to stop blocking passage of the other unrealized priority from last session, the Reproductive Parity Act. This bill would protect a woman’s right to choose by making sure that her insurance covers reproductive services equally. Making sure that women, and not their insurance companies, have the freedom to make their own medical decisions is a vital and fundamental safeguard for women. I continue to be frustrated by the delays in developing the transportation revenue package our state so badly needs, and there’s really no way to speak about this honestly without putting the responsibility where it lies — with the Republican majority in the Senate. I don’t say that lightly. But the facts speak for themselves. Back in the 2013 legislative session, the House developed and passed a transportation revenue package and sent it to the Senate. Sometimes each chamber will develop and pass a package of its own, then reconcile the two in late-session negotiations; in other years, it’s not uncommon for one chamber to pass a package and the other chamber to amend it back and forth until they reach agreement on a final version. But last year, Republicans with the help of two former Democratic Caucus members took control the Senate and declined to develop a Senate transportation package and refused to consider the House package. We Democrats tried to pull the package to the Senate floor in an effort to get things moving, but the Republicans used their majority to prevent even that from happening. After months of continued inertia during the legislative interim, Gov. Jay Inslee called a special legislative session in November to jump-start talks. But after more negotiations, Senate Republicans insisted on putting off a decision until the 2014 legislative session that began last month. Now, less than halfway into the session, we’re hearing that Republicans again want to postpone any serious negotiation of a transportation package — this time until next December, nearly a year down the road! The problem with that, of course, is that communities across our state have urgent transportation needs that are going unmet. We have roads that need to be maintained, bridges that have to be repaired or replaced, ports that need easier access by the trucks that haul our manufactured goods — in particular, State Road 167 and Interstate 405. When we neglect to maintain our roads and bridges, or to improve dangerous roads and intersections, we jeopardize public safety. When we fail to provide infrastructure to relieve congestion and connect our ports, we make it unreliable and expensive to move the freight that drives our economy. When we decline to provide additional transit alternatives, the congestion on our roads only worsens. We can do better. The Democratic majority in the House fulfilled its half of the bargain a year ago. It’s time for the Republican majority in the Senate to stop dragging their feet and fulfill their half of the bargain. Many of you know of my longstanding effort to create a state bank, or trust, that could loan state funds for public projects and keep the interest on those loans and put them toward other public uses. Under the existing system, state funds are handled by commercial banks that funnel the interest to their corporate masters on Wall Street. My proposal, Senate Bill 5955, took on added urgency with last fall’s passage of Initiative 502 to legalize recreational marijuana. Though this made marijuana legal in our state, it is still illegal at the federal level — and the conflict between state and federal laws has created serious problems for those who would cultivate, sell or buy marijuana in our state. One, commercial banks cannot handle marijuana funds because they are illegal under federal law and subject to seizure. Two, marijuana farmers and sellers wind up with large stockpiles of cash, making them cash-rich targets for robbery or other criminal activities. Clearly, those who would grow or sell or buy marijuana need a safe, reliable marketplace that doesn’t endanger their earnings or public safety — and that’s where a state trust can step in. Even though marijuana remains illegal under federal law, the U.S. Department of Justice has indicated it would be less likely to investigate marijuana activity if it were closely regulated and met certain criteria — actions that commercial banks are ill-equipped to meet. While no entity can provide an ironclad guarantee against federal seizure of funds, a state-owned trust can mitigate the risk because we can structure a trust specifically to meet the attorney general’s criteria. But we need to act fast. The state expects to begin handing out licenses and receiving tax revenues from marijuana sales as soon as March. And that means we need to have a solution in place. My proposal has had a hearing in the Senate Financial Institutions and Housing & Insurance Committee but has yet to make it out of committee and to the Senate floor. I’ll keep you posted on how things proceed. While all Americans have the right to honor the religion of their choice, they don’t always have the ability — particularly when their holiest days aren’t recognized by our society’s standard Gregorian calendar or workplace schedules. What if your holy days don’t fall on a Sunday or even on the same day every year? That’s the frustration faced by Muslims, Jews and others, and the reason I’m sponsoring Senate Bill 5173. This bill would allow state employees to two unpaid holidays per calendar year for reasons of faith or conscience. It costs nothing, because the holidays are unpaid, and it places no requirements on private employers. But it would also allow students to be excused from school for reasons of faith or conscience for up to two days, subject to the approval of their parents. candidates — and that means paying a fair market wage. This is especially true as we strengthen our teacher evaluation programs and implement new and innovative curriculums to improve student learning. Cost-of-living salary adjustments for teachers and educators, or COLAs, were approved by 62 percent of voters in 2000 when Initiative 732 went on the ballot. But since the beginning of the Great Recession, the Legislature has suspended the COLA for six straight years. During that time, rising inflation has reduced the purchasing power of teachers’ wages by 16 percent. As we recover from the recession, it’s high time that we give our teachers the COLA that the voters approved to address the needs of our schoolteachers and children across the state. The entire Senate Democratic Caucus has signed on in support of legislation to restore the COLA. This also helps us address our constitutional obligation to fully fund basic education – the Supreme Court just pointed out that the state wasn’t paying its share of teacher compensation. From the classroom to the lunchroom, from the library to the nurse’s office, dedicated teachers and staff are working together for the quality education of our children. Let’s give our educators the COLA they deserve so we can attract and keep the best educators possible for our children.